Just yesterday morning I was writing about how I miss seeing you around the house. Because I really do! I love looking at you all – mommies, babies, cheeky youngsters, the big bulls – you are a joy to watch go about your daily business of eating, playing, bathing and drinking. I love the way you smell all earthy and musky and your low tummy rumbling sounds always bring a smile to my face. We have had our differences in the past, I realize that. But that was during the Marula season and I thought we had put that behind us. I appear to have been mistaken. Because you came as thieves in the night late yesterday evening – And even though all of our tall wild grass has been taken out and there is lots more for you to eat in the rest of the Kruger National Park, you still decided to break in and destroy the little bit of a garden I have worked so hard to create in the last 8 months. And don’t even get me started about my vegetables and my little nursery! Was that really necessary? Let’s do a quick damage report, shall we? My Umbrella Thorn: ringbarked. Which means this beautiful tree is going to die. I love the shade it provides in our garden. Then my poor kudu lilies… They just started to recover after the last time you feasted on them. And they were flowering too! I have not even had a chance to take a picture of its beautiful flowers, but now most of them are ripped up. I sure hope they tasted nice. My aloes… the biggest one of them you tore out and left. A dear friend of mine from Pretoria gave me that aloe plant. Are you going to tell her what you did? I think you owe her an apology. But, the worst thing and the main reason I am writing you this letter is my Barberton Daisies!!! I have a few in my garden and only one has made flowers in the 8 months we have been at the gate. And one of you stepped on them! Not cool you guys… I loved those intricate little flowers. There is so much food in the rest of the wilderness we call home. How about you can have áll of that, and I have the little area inside our fence to grow things I think are pretty and nice? I mean I know I live in the bush and everything, but I am still a girl. And we like pretty things! I will make an exception for when the juicy marula fruit starts growing on the trees close to the gate again. I know how much you love them and I would not want to keep that from you. And as a gesture to me, would you just leave my pretty flowers for me to admire? Please? Let me first say again how I enjoy your stories though this one sounds a bit sad…. Oh dear, I really feel sorry for you but hope that you do not give up your efforts ! Love reading about your life in KNP. We, the Elephantoms of the Malelane area would like to offer you an apology. We had no idea that you valued those ridiculously tiny plants – not even a mouthful – so much. To us they are just a softening layer over the earth. However, that being said, I wonder if you realise how exciting it is to come across a new flavour even if it is only enough for a single crunch on one molar? All day, more or less, we eat twigs and bark and grasses and leaves and branches. The only variation is seasonal texture really. All day every day, same old same old. Then we get to a place where there are some very different scents, and of course we have to try them. . . and we’re hooked. . . . wheeeeeeee – this is our party time! Paaaaaarrrtaaaaay! If you could hear our subsonic rumbles you’d know how excited and happy we are amongst this exotic fare. As for the umbrella thorn – why they’re everywhere Linda. Just look around you. You can’t be serious? Its really not worth trumpeting about. Well – OK, we’re sorry for that too then. But because we like you, we’ll give you a little trunks-up. We really don’t like walking over sharp spiky rocks and boulders so if you encircle your tiny precious plants in a wide ring of this – remember the variable of the Trunk-Reach – maybe implanted in that hard grey stuff , we might be persuaded to leave them. Best wishes to you and your babes . We’ll try and remember not to crush those daisies next time. Thank you for you quick reply. I will answer your letter tomorrow if that is ok. I am busy teaching my calves how to use their trunks. And you know what a mission thát is! Sleep tight and remember, there is no more new tastes in my garden. You tried them all. My apologies for my late reply. My youngest calf has kept me up most of the night and busy most of the day. First of all, I would like to thank you for your kind reply to my letter and for trying to understand where I, your two-legged neighbor, am coming from. See unlike you, us two-leggeds, don’t move around looking for food all day. We mainly stay in one spot. Our food comes from a cold box inside that big yellow house with the red roof. And since we call that place our home, we like to be comfortable there. With good shade and some water and a safe environment for our calves to play and grow up. Unlike you, we do not have a super sense of smell or hearing. We are kind of stupid that way. So we need to protect ourselves from the lions and the leopards that we know live in the area we call home too. That is why the fence is there. And since we are going to stay in the same spot for a while, I thought I would make my garden (that is what us two-leggeds call it) look nice by planting some flowers and growing some food that does not need to be in the cold box inside. 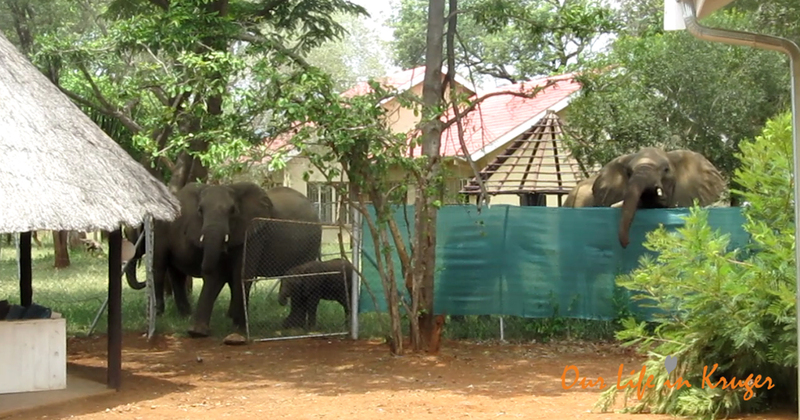 These ellies owe you a written apology! The cheeck of them, coming in and just ripping out your pretty flowers. I think we have to report them to the section Lion. Hear what he has to say about it. Oh dear, what conflicting emotions this raises. Sadness at the loss of your garden and hard work, anger, but you can’t be angry with the ellies doing what they always do. Don’t give up try again with other protections in place, not sure what will work though. Makes me understand your neighbour not having any garden at all. Aaah – so sorry about your garden. Very sad and disappointing that the Malelane ellies did so much damage. They just don’t understand why you humans plant such interesting, juicy plants for them and then get upset when they eat them. And walk on them. The spiky rocks suggestion sounds interesting and hopeful. Meantime, they thank you for the variation in their diet. Yours, scratch, truly – scratch – the – scratch – broken – scratch – record…..scratchety, scratchety scratch!!! Hahaha, thank you! And you don’t sound like a broken record at all! So I had a ‘false sense of security’ and look what happened! I am going to have some fun trying out a whole bunch of elephant deterring schemes and I shall report back. With regards to the chilly paste, I pitched the idea to Steven, but he says that if an elephant smells something spicy like that and really wants to come in, the go in bum first. How is that for clever! My, oh my, they are naughty Ellies. So sorry about all your plants and veggies. Loved the photo of the ellie peering over the screen! Looked suitably sneaky. Hope some of the advice given works for you. OMGosh I just love this letter and the replies………lol!! Very sorry to hear about your garden that’s a shame, but I do hope you continue to plant & grow your garden. The photo at the top just says it all with that mischievous peer over the fence! Oh Linda you plead so lovingly……sorry for your loss.You could make a moat around your lovely gardens. I feel for you. Naughty ellies. Ik heb weer GENOTEN van deze blog. Wat een geweldige brief aan de olifanten! En het antwoord via Sal vond ik ook te grappig! Samen met je eerdere blog Dear Monkeys in the Garden zeker een van mijn favorieten! Sterkte met het beschermen van je mooie en lekkere planten! Thank you for your reply which has certainly clarified the damage we have done to your resting place and grazing patch. We would like to emphasize the fact that the damage was incidental to our feeding pattern and truly not intentional. We are peaceful animals on the whole, although we have to admit to feeling some stress around you two-leggeds as not all of your kind regard us with the same gentle respect that you do. We are able to read your body language and often pick up your thoughts and intentions; as your numbers in our range are increasing, and your behaviour not always considerate, this upsets us as a group. However, be assured that we don’t feel this way around you personally – we just hunger for the delicacies we find in your home range as they are not to be found elsewhere. Next time we shall try to walk more carefully and leave you more ellidence for your soil.